Live Link is http://live.schoolkalolsavam.in/ – by visiting this weblink you can watch all the live updates of Kerala school kalolsavam through your computer or mobile devices. How can i watch the live coverage of the 2016 Kerala School Kalolsavam ?. Kerala School Kalolsavam 2016 Starting on 19th January 2016 and end on 25th January 2016. Trivandrum is hosting the 2016 season of kerala school kalolsavam. You can get the updated result of school kalolsavam by visiting the official mobile app or website. http://www.webtv.reelax.in/ is the official online streaming link for watching the 2016 Kerala School Kalolsavam. 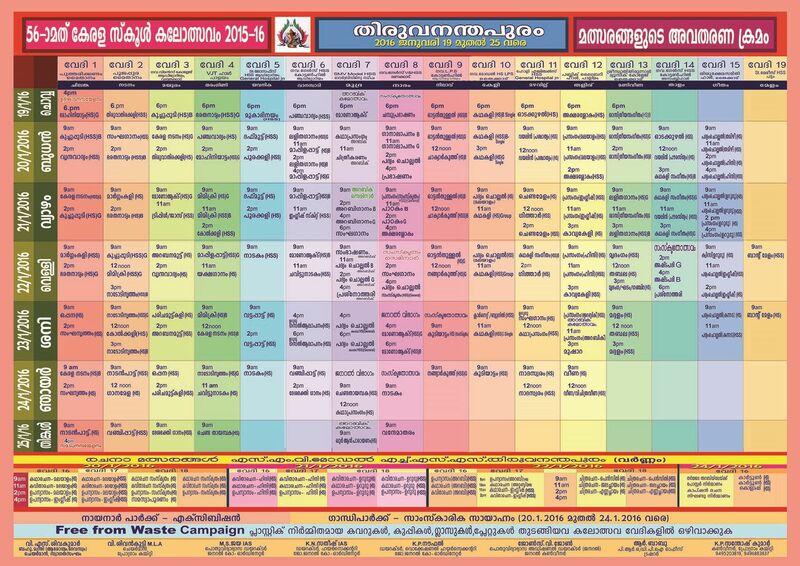 You can check the complete schedule of Kerala School Kalolsavam from here. Click on the image to enlarge and download the full schedule of the same.